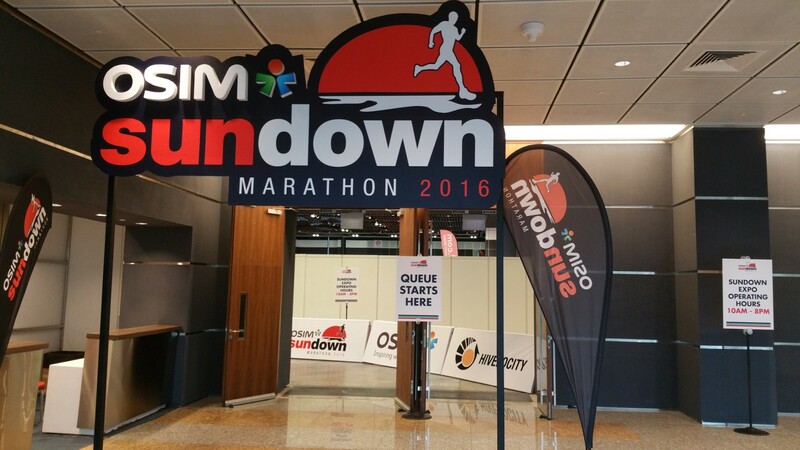 Race Review: OSIM Sundown Marathon 2016 [FM] (by Kenjoe) | JustRunLah! 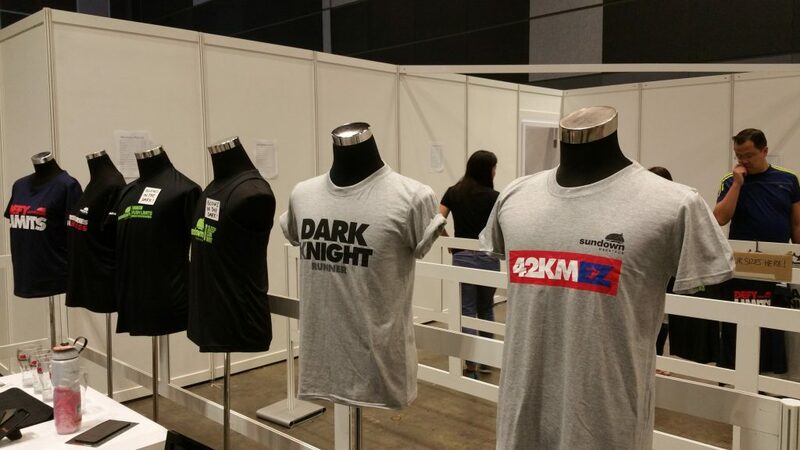 To run or not to run, that was the question which hounded me for a bit in Sundown Marathon. Well, just a wee bit, because I was dead set on running the marathon. 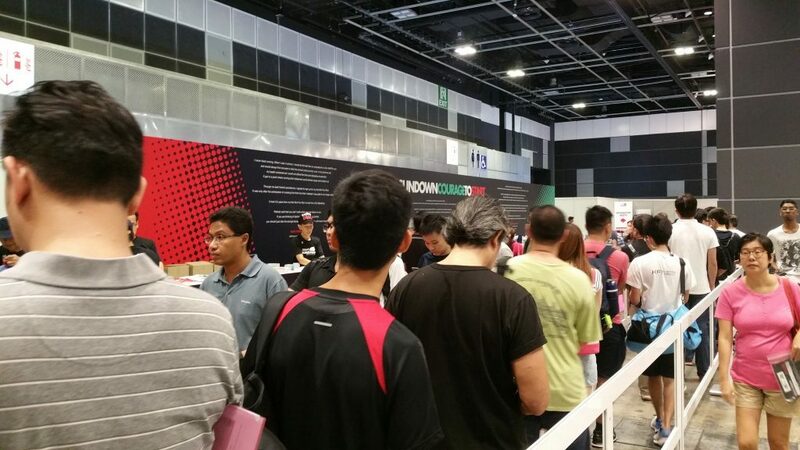 A little doubt arose, primarily due to me getting an injury about a month or so before the OSIM Sundown. I had Plantar Fasciitis (PF) years ago when I was working and suffered for 2 years, and the reason seemed to be the working office shoes that I was wearing. Back in April this year again, I experienced the pain akin to that, coming on in the morning, feeling better after I stretch my calves in the morning. 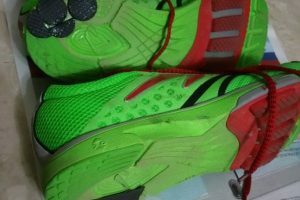 On reflection (and research too), it was probably due to me switching my running shoes too quickly, with too high a difference in the heel drops and also my attempt to change my foot strike too quickly. This was one of probable causes of PF. Which is good learning for me, but the hard way too. What if this turned into a stress fracture or something? But anyway, I’ve already worked my way through my two big goals of this year : two half marathons within the week in April and the Spartan Super race in early May, and I wasn’t going to miss the Sundown this round. (Moreover, I also agreed to help support run the Marathon with SimplyGiving though at race finish, I had garnered zero dollars for my effort !) So I forced myself to stop running daily and took time to recover. 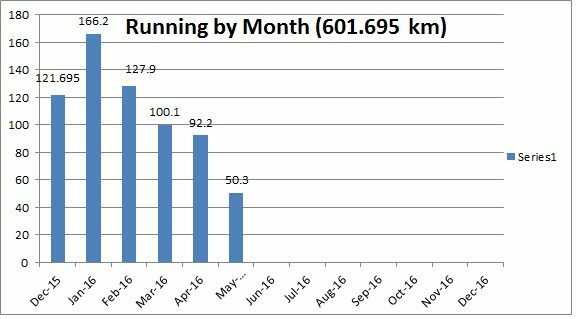 From a high of 166 km in January, to a low of 92.5 km in April, and now about 45 km before the Sundown in month of May. 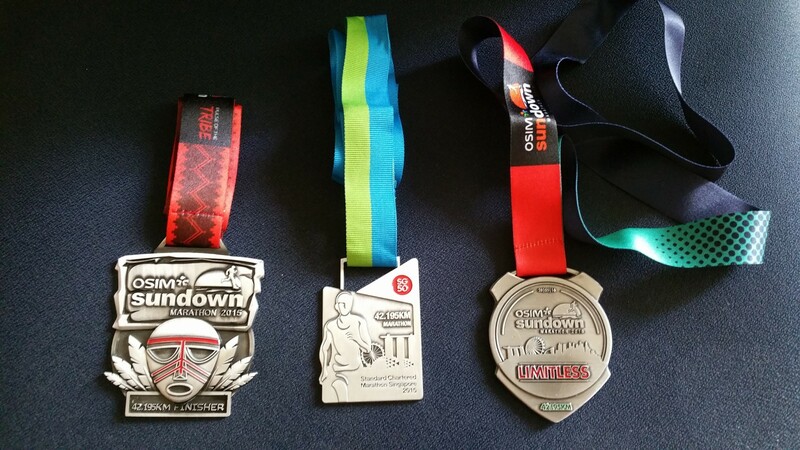 I had covered about 600 km through training/races since the last Marathon. I tried to do other forms of exercises to keep myself fit though they were rather half-hearted as I still preferred running to push-ups, chin-ups, planks, bridges and the occasional cycling at the gym, plus swimming. I found myself gaining weight (also due to carbo load to some extent) and felt the urge to run. 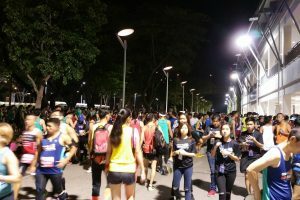 Two days before Sundown, I went for a 3.5 km primer run after last Sunday’s Straits Times Run in the City, 10 km race where I did a modest 1:12 hr. And then found I was in a dilemma over the running shoes. 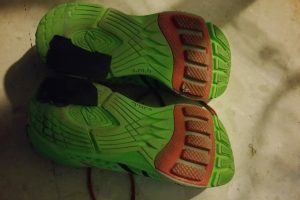 The Newton shoes had worn out pretty fast and my alternative New Balance shoes had gone through muddy water in Spartan Super, both were uncomfortable for the long haul of a marathon. 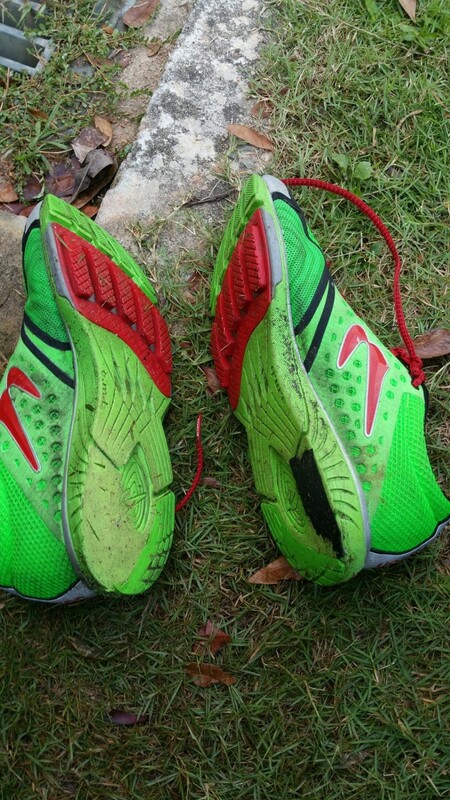 Should I get a new pair, but so terribly near the race? I decided to stick with the familiar, so I just patched the eroded soles with some more black rubber. I honestly too didn’t take into account the fact that I would have worn out so many shoes just through running – about 4 pairs already. I ran another 1 km in the evening to ensure the patches were intact. Now, I was more or less set for the big day. Or was I ? 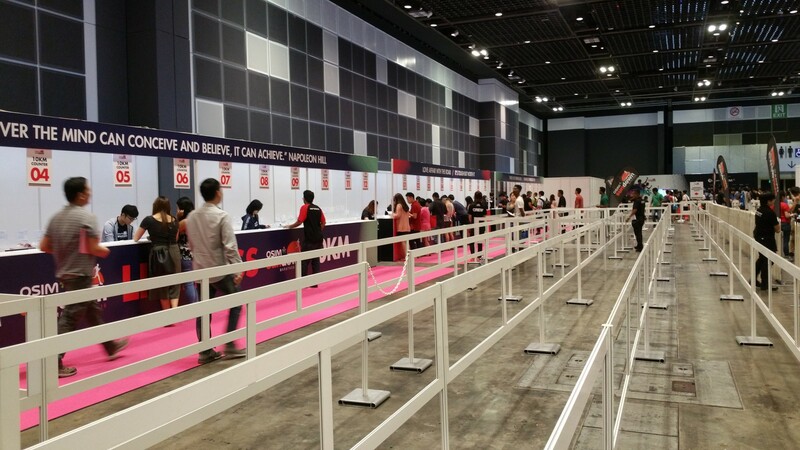 After my first full marathon (also Sundown) back in July last year, I had attempted the next full marathon Standard Chartered Marathon. I slided from 6:12 to 6:28 timing, probably due to fatigue of races done in second half of last year. This round with injury, was I going to make it? A friend (SY), another avid runner, jokingly told me I would complete in 7 hours knowing my pace and injury. He also ominously told me that runners could die from marathon races… well, if they are not well prepared. I didn’t really think so much of 7 hours as a goal (or conking out so soon). 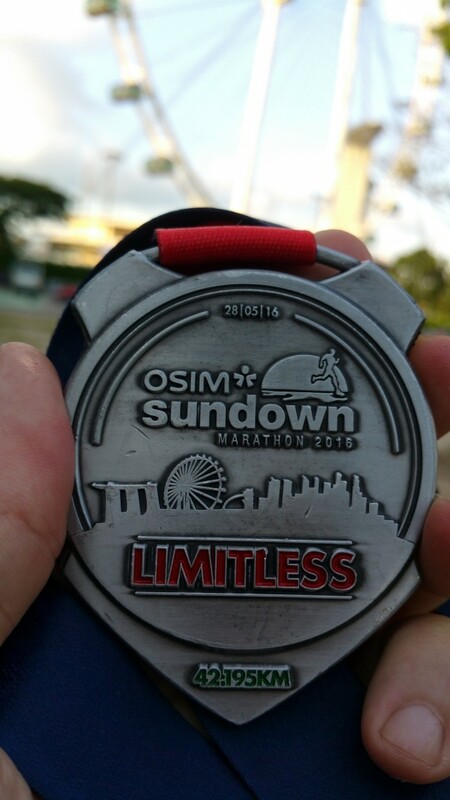 I still hoped to finish faster because I thought I had learnt from the past two marathons and all the 34 races done in past 1 year 5 months. Despite my conscious efforts to reduce my races this year, I was still doing about two races per month for past half year, continuing the trend for last year. The day before race, I took out the bib and recalled that the collection about a week ago, was a breeze. 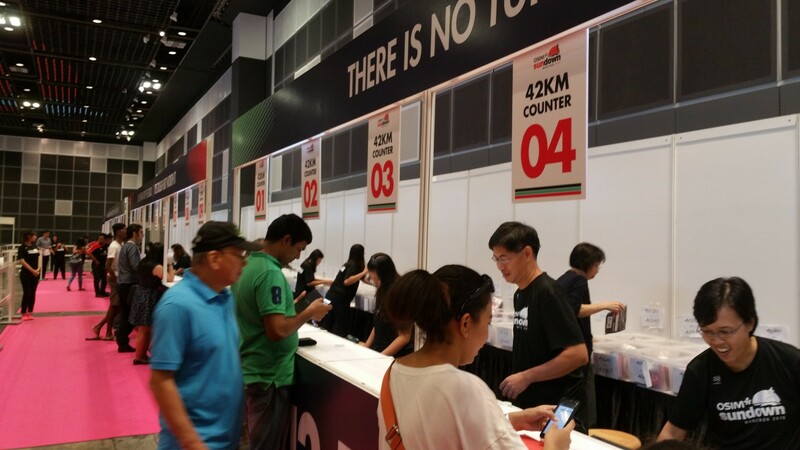 As was usual with the big races, after collection, we passed through the many running exhibit stalls including JustRunLah, OnCloud shoes, KeyPower International. 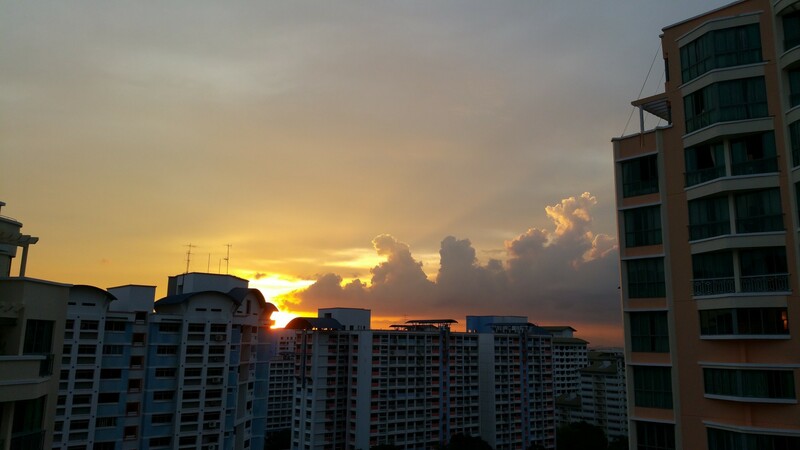 That day, I took a picture of the Sundown from my home, beautiful start – I thought. I picked the same singlet that I had been racing in for most races this year, placing my cap, towel, shorts for changing etc into the bag. 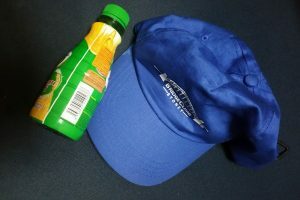 This time, I took four packets of energy gel along with a small recycled bottle for hydration. 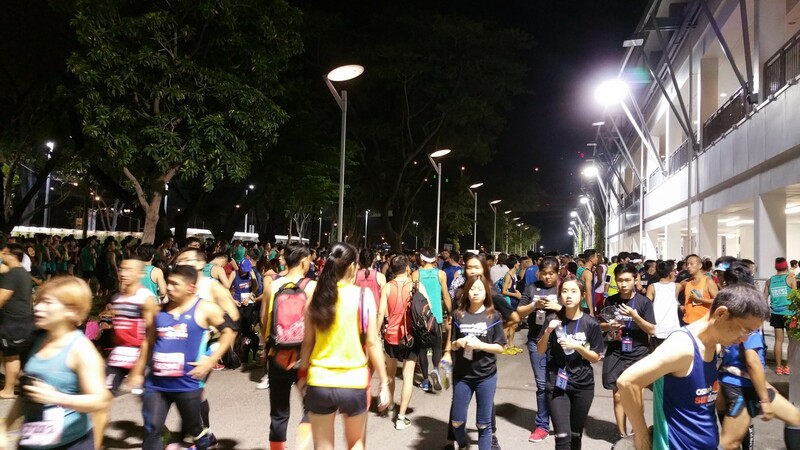 The race was to start at 12.30 am Sunday for wave 1 competitors. I saw the live telecasts on facebook of the 5 km, 10 km races where my running friends were participating in. 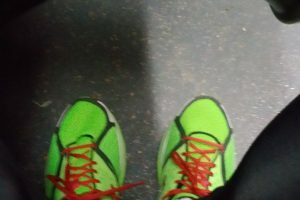 Then I set off before 10.30 pm using public transport this time. Got there early but the crowd was just amazing. Managed to deposit bag quite quickly though. My friend, Francis, had completed his 10 km race and kindly passed the energy patch for me to try. He left soon after giving me the instructions on where to put the two strips on the body. 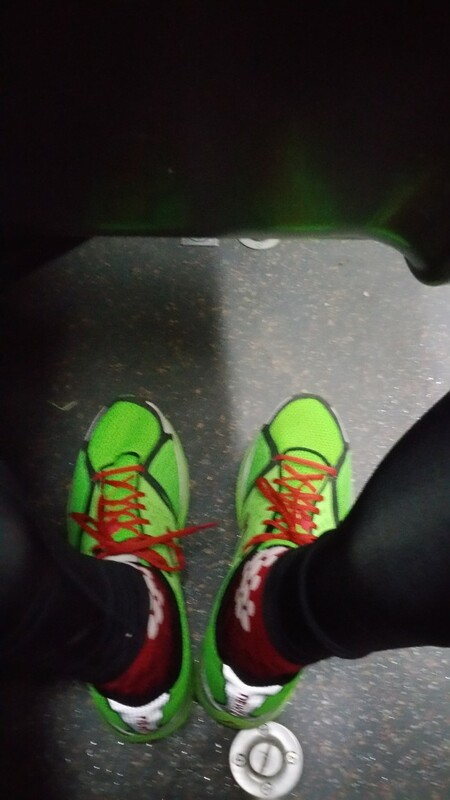 I held onto them till just about 10 minutes before the race began and stuck them on. I soon forgot about the patches on my body. I kept to my plan of consuming the energy gel every 9 km or so. So after all the reading/research, I told myself to pace myself properly this race. Which meant I was wearing the Soleus GPS Mini that I won in a lucky draw which explained the color choice (young sea green). Actually, I was also wearing the compression socks (shocking red) ‘free’ from the compressport rail run, and ‘free’ 2XU compression tights from my early queueing for the OCBC Cycling Event a number of weeks ago. No sponsors for old and slow male runners like us, but hopefully I continued to get lucky for some of these draws. It would get too costly to sustain all the races I was signing up for. I looked at my watch every now and then for the first 10 km trying to maintain below 9 min pace. At the beginning, it was still quite alright, but we hit a slight incline. Slowed my pace down further and continued on. I got sleepy too despite the gel with caffein. Night was warm with little wind. Day before it had rained quite heavily, and there was a drizzle in the morning back home in the West. 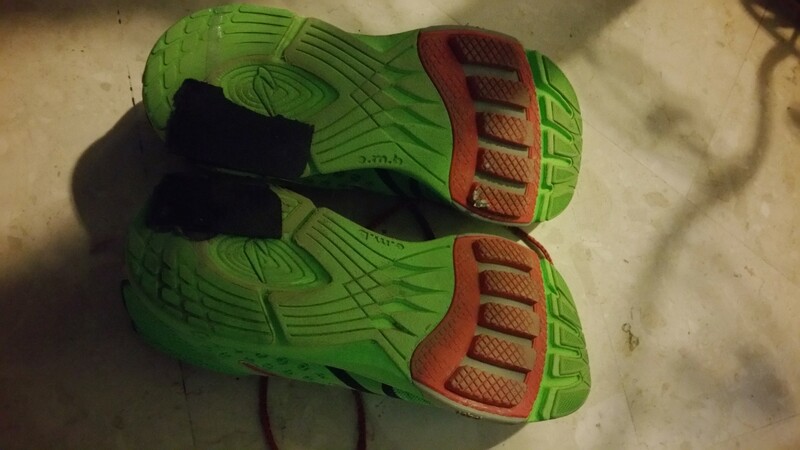 I felt more keenly the impact of the surface of the road on my soles and suspected that the sole rubber had eroded much, especially so on left side, due to the pronation on my left foot. I didn’t bother to check as it would not help me. I put the thought away and focused on completing the first 10 km. The second 10 km was a bit more challenging, but it passed by too as expected. The half marathon races had helped. Still, I started to feel the strain of the injury after 20 km. When I bent down to tie my shoelace which had come loose, I felt the tightness as I stood up. I was getting hungry somehow too. I started to focus my thoughts on just running. Follow the front folks who were running. After 22 km or so, I started to count every 1 km, and looking forward to the next hydration point. I had carried the recycled water bottle in my left hand most of the time which I tried to fill with the 100Plus or water. Good thing was I don’t feel any chafing hurts which I had suffered in the past. But my feet were hurting badly, like broken into two halves, the left foot especially. I decided to put my backup plan to work. Walk briskly every 60 seconds or so, and run every 180 counts or longer. It worked to some extent. After I took my third packet of gel at 28 km, I was wondering could I last another 14 km plus. I told myself, I had come this far, sure can make it and will make it. I was talking to myself in the head more and also to stay alert. I had skipped taking the banana at one of the stops because I thought it was too early and starting to regret it. I continued to walk and run, varying the counts depending on whether I was panting too much. I also tried to remember whatever I had read, like Chi running. Breathe through the diaphragm, take smaller steps, shuffling but trying to keep the cadence, and even curling the body somewhat as you get more exhausted. But I tried to straighten again and felt better and so I continued to run a bit longer, walk for shorter duration. I had stopped looking at my watch as regularly because I found myself too preoccupied with pace and it wasn’t helping at that stretch. 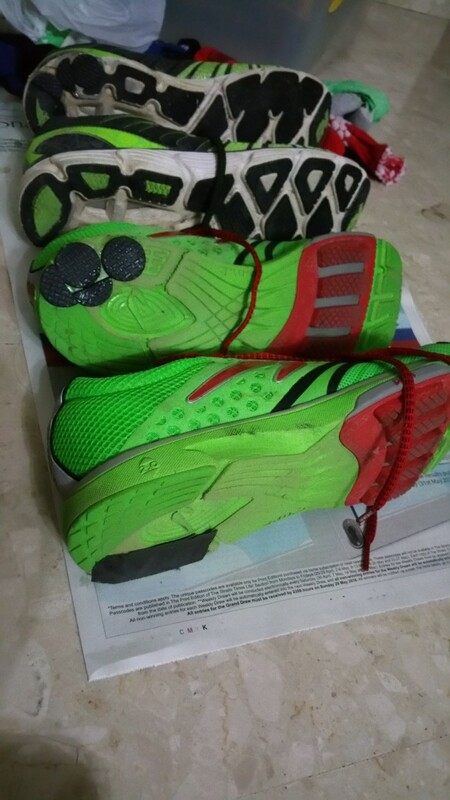 I was more used to running without any gadget and hated to carry anything extra. Soon, 29 and then past 30 km. I gave a silent prayer as I didn’t hit the wall at all thus far, and had no leg cramps, just the feet hurting which I managed to ignore to large extent. 31 kilometres, was I glad to get over it. My feet was hurting badly but I tried to tell myself that the sooner I reached, the better off for my feet. Strangely at 32 km, I felt a resurge of energy and told myself, only 10 km left, forget the past, treat this like many of the 10 km races I had done in the past half year. So I psyched myself up, and I picked up on my paces, overtaking more than two dozen runners as most were walking somehow at that stretch. I continued for about 2 km. I must have hit a running high somehow in the midst of this race. I stopped to take the drinks, didn’t take the bananas again, as I felt full somehow, perhaps the effect of gel and the patch on hindsight ? 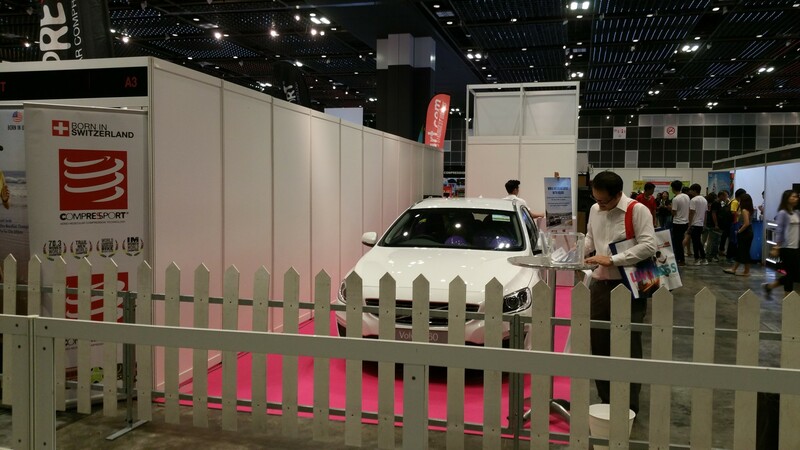 But a short distance away, another volunteer offered a small banana which I took. Only 8 km to go, can I maintain the pace, can I better my last PB ? If only I could maintain the same pace but I found myself slowing down again, though not to a walk but slowing down after the hydration point. Perhaps I had taken too much drinks and the body was trying to divert some energy to digesting ? 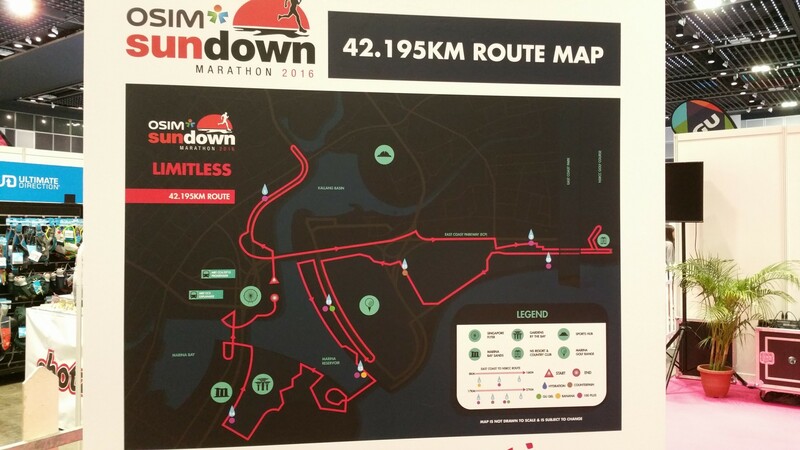 The last 5 km saw another incline, up Marina Barrage and down. If I ran at 9 min pace, it would take another 45 minutes, so I started calculating in my mind, pushing myself. By then, I was just running without pausing anymore , and willing the pain away from my feet. In some sense, PF had won, but I had also beaten the odds of finishing with an injury and no, I didn’t get a PB, though I did beat my friend’s friendly target. I completed in 6:41:13 adding another 13 minutes to last Marathon unfortunately. I didn’t feel as tired in my legs (which meant that I was doing something right too) but my feet were killing me when I finally stopped after the finish line. 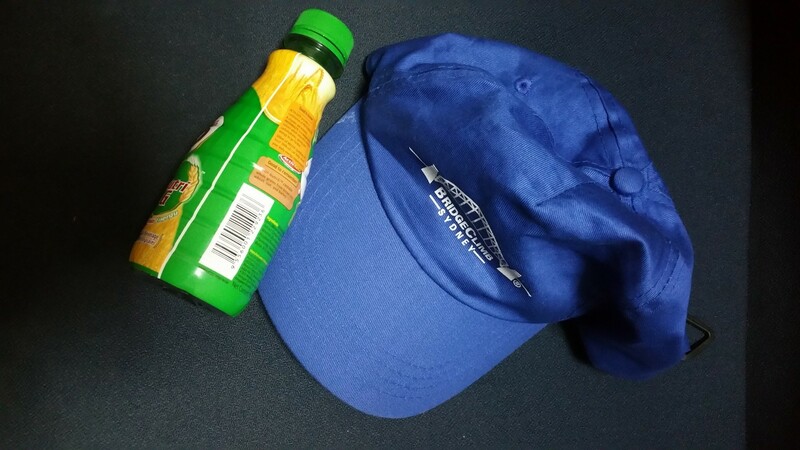 I collected the finisher medal, Tee-shirt, banana, 100Plus and sat for a few short minutes this time before collecting my bag. 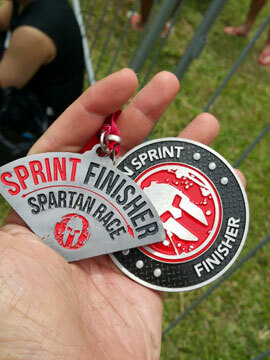 I took the picture of the hard-earned medal, took off my socks and realized that my two big toe nails which were recovering from bad black toenails were bleeding again. My left foot felt like broken into half. And my shoes, worn out with rubber layers gone on left foot as suspected. After putting on some foot powder and wearing back the shoes, I walked gingerly off to the MRT and made the long way home back west, feeling tired but satisfied that I had beaten the third monster that I chose to battle. Mind over body, to run another day, another race… Limitless indeed is the mind if you put your heart to it. Steely determination sees one through most adversities. 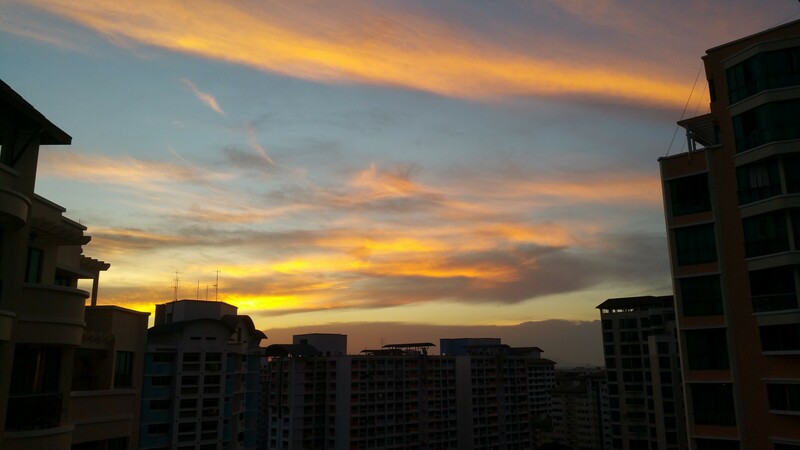 And that Sunday’s Sundown was even more beautiful. Yes, I believe there are more runs in me, and I will better my first PB. Now, I just need time to recover from my toes and my feet. And that’s the story of how a 53 year old runner with two years of running experience got his third full marathon done in span of 10 months.